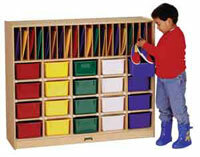 Removable folder partitions and cubbie trays for twenty students. Inside cubbies:8-3/4"W x 14"D x 5-1/2"H. Caster mounted. Overall dimensions 48"W x 15"D x 40"H.